Today, the Justices of the Supreme Court of Virginia elected Justice Donald W. Lemons as Chief Justice-elect. 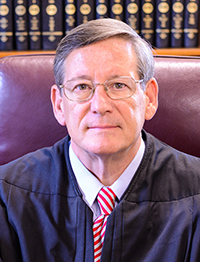 Chief Justice-elect Lemons will succeed Chief Justice Cynthia D. Kinser, who has served one term as Chief Justice and will retire from the Court on December 31, 2014. Chief Justice-elect Lemons will assume office on January 1, 2015. He was elected by the General Assembly to the Supreme Court of Virginia in 2000 and again in 2012. Previously, Chief Justice-elect Lemons served as a judge of the Court of Appeals of Virginia and the Circuit Court for the City of Richmond. He received both his undergraduate and law degrees from the University of Virginia. After receiving his law degree, he served as Assistant Dean and Assistant Professor of Law at the University of Virginia School of Law. Thereafter, he has served on the faculties of the University of Richmond School of Law and Washington and Lee University School of Law. Chief Justice-elect Lemons has held leadership roles in numerous legal and civic organizations, including serving as the President of the American Inns of Court. Current Chief Justice Kinser remarked that "Chief Justice-elect Lemons is a dedicated jurist who exemplifies integrity, civility, and professionalism. He will lead the judiciary with distinction during the next four years. I look forward to working with him to effect a smooth transition."